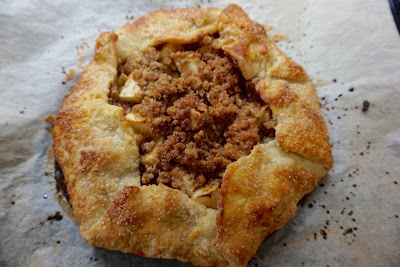 Time for a little post (ha, well past time) because this one has been sitting in draft stage for literally two years and every time I bake it I have to click my way through my working blog pages slightly annoyed at myself for not ever finishing the recipe for a fairly easy and really delicious apple galette. For the record, galettes and crostatas are the same thing as least to me, rustic fold-over one crust vehicles for cooked fruit and possibly savory things. The fastest way to pie and just the right amount for 4 to 6 people, well 8 people, if your people are the "just a little slice" type. No judgement on those people, but they'll probably want more if they take just take a little slice. I recently served this after a big dinner and cleverly had enough leftover for a breakfast/coffee treat. I have my ways. You can make your own pie/galette dough and it is completely worth the small effort required. This galette dough recipe is really about the technique. Alice Waters of Chez Panisse surely knows her pastry so I have not adapted it really at all. I usually make half a recipe because I have a small freezer m my small refrigerator, but if you have the room go ahead and make the full recipe and freeze one half of the dough for another galette of whatever flavor whenever you feel like it. Buy nice unsalted butter, I find a big difference in taste here in Australia. My go to brand here is Devondale. Quite nice. You can see from my photos that I still have large bits of butter as I roll out the pastry. Big bits of butter make for the flakiest pastry, and under-worked is much more tender than over-worked pastry. I have dough ready for chilling in maybe ten minutes. Give it a go. 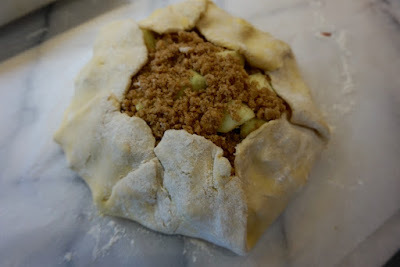 The apple filling is based on a recipe from Ina Garten. That woman knows her desserts, so who am I to change the recipe much at all? Sometimes I slice the apples thinly, but cutting them in chunks is a nice switch. Australian markets offer fewer apple varieties (they are completely missing out) and it's almost spring so not actually apple season down under. But in America, you are all ready for the abundance of Autumn harvest and will be spoilt for choice, as they say here. So mix up your apples. Go pick some and or buy some that are marked good for baking. Use a couple of each variety. Here I used all Granny Smith (told you the varieties were lacking). The apples are tossed with orange zest (oranges are in season here and so I used a nice big blood orange) and then sprinkled with a streusel. Quite nice. Serve your galette warm. Make it early and leave it on your baking sheet to easily reheat it before serving or slide it in the oven before you sit down to dinner and have it ready and waiting for a little scoop of vanilla ice cream, frozen yogurt or gelato. Australians might serve it with double cream which goes on in a dollop. Also quite nice. Writer's note, after almost three years here in The Lucky Country, I feel the need to make some notes and conversions. I also say things like "quite nice" and "give it a go" which are delightfully Australian to me. I am well and truly at home here, but still switch very easily to whatever variety of the English language is spoken around me. If only the math (maths as they say) conversions were as natural. Again, this makes enough for two, so make a half batch or use one half and freeze the other. Let the cold butter pieces soften just a bit (just minutes). Test by pressing your finger on one of the pieces and if it presses easily but still remains cold and does not leave butter on your finger you are good to go. If it's too soft, put it back in the refrigerator for a few minutes. This is all for flakiness, but don't get too worked up about it. Mix the flour, sugar and salt in a large bowl. Add the butter to the flour mixture and toss to coat the pieces. Press the butter pieces with your thumb and forefinger one by one to flatten them. When all the pieces are flattened, drizzle in half the water, mixing all the while with your fingers spread and curved a bit, raking the dry mix from the bottom to the top to evenly incorporate the water. Continue this way until the dough starts to come together, breaking apart any large lumps of butter as you go. try not to squeeze the dough together, as this activates the gluten in the flour and can make the dough tough. Drizzle water over one tablespoon at a time and keep drizzling and raking until the dough looks moist and ropey with very little dry flour. It will be forming a good ball by now. Divide the dough in half (unless you halved the ingredients), shape into a ball and flatten into a disc pressing in any random lumps of butter. Wrap in plastic wrap. Refrigerate at least an hour and up to a day. Extra dough can be stored in the freezer for a month or two. Thaw frozen dough overnight in the refrigerator before using. 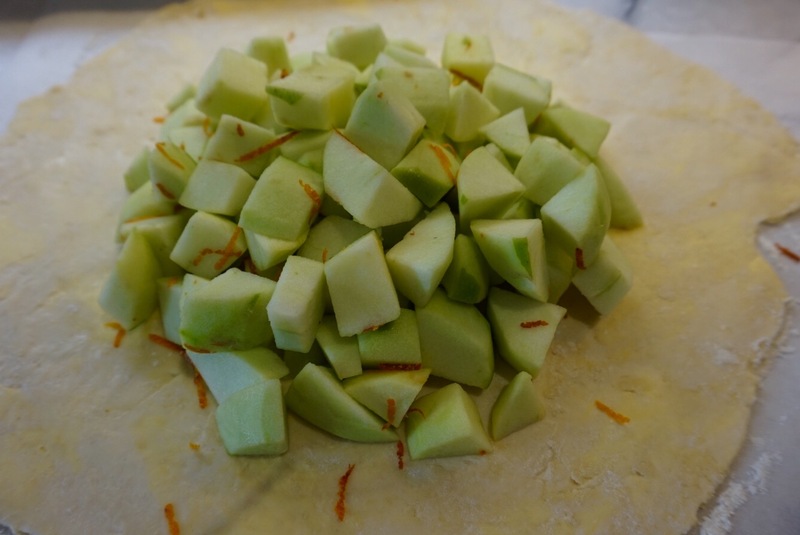 Preheat oven to 425 F/ 200 C.
Peel, core and cut the apples in small chunks (cut each apple into maybe 4 wedges and chop each wedge into about 12 pieces, the number being unimportant what you want is relatively uniform chunk size. Toss the apple chunks with the zest and set aside. In a medium bowl, combine the flour, sugar, salt, cinnamon and allspice. Toss the butter into the mix and use your hands to work the butter into the mixture until you form little clumps about the size of peas. Easily done in a food processor, but I make this in a low-tech, easy clean-up way. Line a baking sheet with parchment/baking paper. Lightly dust the paper with flour and lightly dust the disc of dough too. Roll out your pastry into a circle about 14-inches in diameter. Top the pastry with the apple chunks leaving a few inches around the edges (you will be folding up the crust to cover at least half the apples). 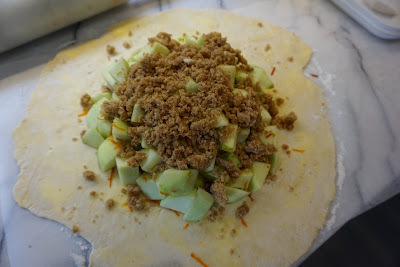 Top the apples with the streusel mixture Work your way around the circle, gathering as you go and fold up the crust around the apples covering at leas half of them. Use a fork to beat an egg white with a couple of tablespoons of milk and then brush the pastry with the egg wash. Sprinkle the egg wash with some sugar. 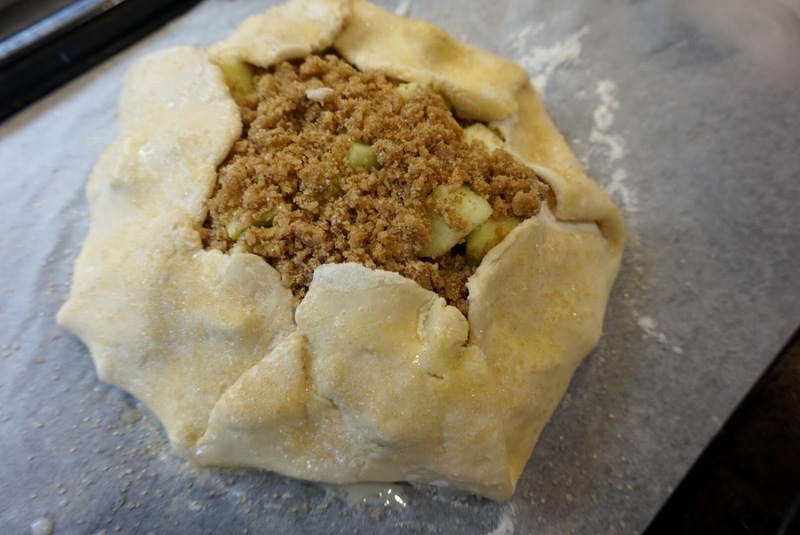 Bake for 25 to 30 minutes until crust is golden and apples are tender (if the crust is browning too quickly, loosely cover with foil and continue baking).